This volume assembles a wide range of studies that together provide—through their interdisciplinary range, international scope, and historical emphases—an original scholarly exploration of one of the most important topics in recent nineteenth-century studies: the emergence in the nineteenth century of forms of global experience that have developed more recently into rapidly expanding processes of globalization and their attendant collisions of race, religion, ethnicity, population groups, natural environments, national will and power. Emphasizing such links between global networks past and present, the essays in this volume engage with the latest work in postcolonial, cosmopolitan, and globalization theory while speaking directly to the most pressing concerns of contemporary geopolitics. 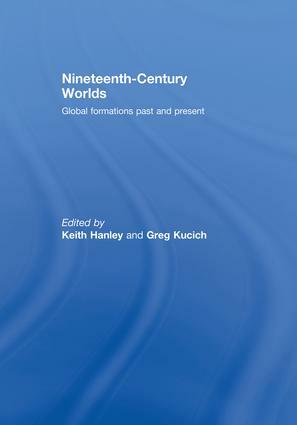 Each essay examines specific cultural and historical circumstances in the formation of nineteenth-century worlds from a range of disciplinary perspectives, including economics, political history, natural history, philosophy, the history of medicine and disease, religious studies, literary criticism, art history, and colonial studies. Detailed in their particular modes of analysis yet integrated into a collective conversation about the nineteenth century’s profound impact on our present worlds, these inquiries also explore the economic, political, and cultural determinants on nineteenth-century types of transnational experience as interweaving forces creating new material frameworks and conceptual models for comprehending major human categories—such as race, gender, subjectivity, and national identity—in global terms. As nineteenth-century global intersections differ in important ways from the shapes of globalization today, however, the essays in this volume generate new ways of understanding emergent patterns of worldwide experience in the age of imperialism and thereby stimulate fresh insights into the dynamics of global formations and conflicts today. 3. "World Spectatorship for Western Commodities in Fin-de-Siècle Posters"
4. "‘A Prodigious Map Beneath His Feet’: Virtual Travel and the Panoramic Perspective"
5. "Cosmopolitan Emigration and the Novels of Charlotte Smith"
6. "Deathscapes: India in an Age of Romanticism and Empire, 1800-56"
7. "The Middle Passages of Nancy Prince and Harriet Jacobs"
9. "Political Economy of the Potato"
10. "Englishness in Africa in the Nineteenth Century"
11. "Typologies of the East: On Distinguishing Balkanism and Orientalism"
12. "The ‘Other’ Europe of Michele Amari: Orientalism from the South"
13. "‘That Imperious Passion’: Don Juan’s Russian Affair and the Vortex of Selfhood"
14. "Geographical Imaginations of the ‘Holy Land’ and the South Levantine Iron Age: Biblical Topography and Archaeological Practice in the Nineteenth Century"
15. "Constructions of Sacred Topography: The Nineteenth Century and Today"